At least nineteen firefighters perished in the Yarnell Hill Fire today. The Daily Courier says the Prescott Fire Department lost nearly its entire crew on Sunday while battling the Yarnell Hill fire. Eighteen firefighters have died in the Yarnell Hill Fire that has ripped through half of the town and sent residents to Prescott for safety. Sources have confirmed that 18 crew members died while fighting the blaze. Officials at the scene of the blaze couldn’t provide The Arizona Republic information on any injuries or deaths but said they expect about half of the town’s 500 homes to be decimated by the fire that is currently burning with zero containment and has grown well past 2,000 acres. Mike Reichling, Arizona State Forestry Division spokesman, said the fire is quickly reaching “Type 1” status and that federal authorities will be brought in to help Monday morning. Reichling expects the manpower dedicated to the fire to reach about 400 people as federal help arrives. 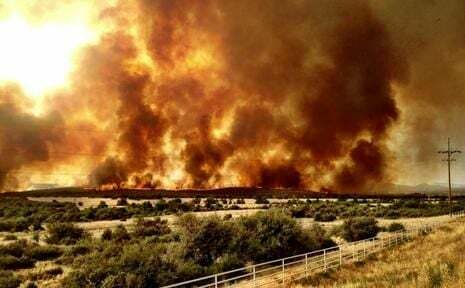 Wickenburg Community Hospital is expecting to treat about eight firefighters who were among about 22 injured battling the fast-moving, 2,000-acre Yarnell Hill Fire that has burned through have the town, officials said Sunday evening. It’s unclear if any in this missing group is among the dead firefighters. Yarnell is northwest of Phoenix.